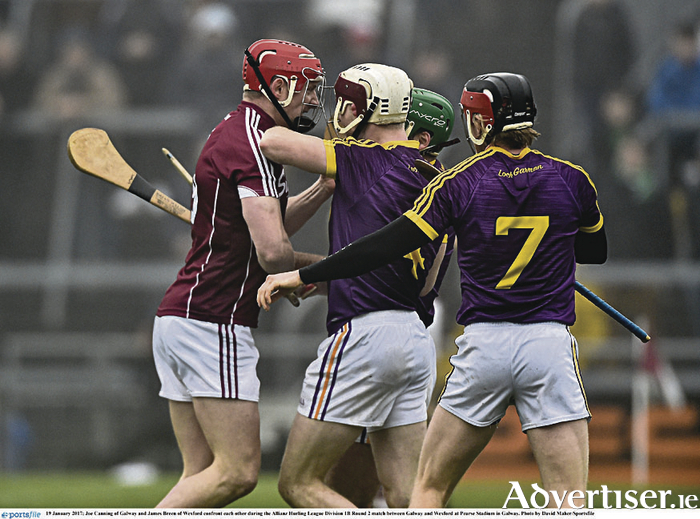 Galway hurlers must match Wexford’s physicality and get enough ball into their attack. Sparks may fly: Galway’s Joe Canning and James Breen of Wexford during their league encounter. The Galway senior hurlers will be hoping to win a second Leinster hurling title this Sunday when they take on Wexford in Croke Park (4pm ). Galway are in the final for a third successive year, on the back of two easy victories over Dublin (2-28 to 1-17 ), and Offaly (0-33 to 1-11 ) in the semi-final. Galway team manager Michéal Donoghue admits those wins were easy enough. While some might be concerned with the quality of opposition as preparation for the final, Donoghue says his team could only beat the opposition they faced. “You can only play what’s in front of you. The main thing is there’s good confidence going through the team," he says. "We’re happy with where we’re at. "Winning is a good habit to be in, and we now have a few wins in a row which is a good way to be going into a final. We are just looking forward to Sunday now. Wexford, under the guidance of Davy Fitzgerald this season, defeated Laois by 3-25 to 1-17 in their first outing, and then registered a first championship win in 13 years over favourites Kilkenny. They did so by 1-20 to 3-11 in an enthralling encounter in Innovate Wexford Park. As a result Sunday is a big occasion for Wexford. It will be their first Leinster final since 2008 and following their promotion to the top flight of the league for 2018, represents real progress under Fitzgerald’s management. The Clare man brings a busload of enthusiasm and energy to his managerial positions, and the Wexford players and supporters have responded. There is a huge air of expectation now in the county that they can add the Bob O'Keefe Cup for the first time since beating Offaly in the provincial final in 2004. Wexford have some fine players. Lee Chin, Paul Morris and the returned Jack Guiney all had powerful games in their win over Kilkenny. All the forwards had a good degree of success against their opposite numbers in that tie, and it will be interesting to see how the Galway defence deals with the step-up in quality and intensity from the Offaly and Dublin games. Wexford had nine different scorers against Kilkenny in their championship win, with Lee Chin their top scorer with 0-6 (3fs and 2 65s ). However there is a major doubt over the availability of corner forward and free taker Conor McDonald, who scored five points that day. Troubled with an ankle injury in the past few weeks, he would be a significant loss for Fitzgerald, and was one of Wexford's players who did some damage to beat the Tribesmen in the league. Galway also have their injury concerns with both Cathal Mannion (ankle ) and Joe Cooney (hamstring ) in a race against time. Galway will enter the game in a good frame of mind after winning the league convincingly. There is a solid look to the Galway defence with Daithí Burke and Gearoid McInerney anchoring the middle, and Aidan Harte and Padraig Mannion having a big influence from their wing-back positions. Johnny Coen and team captain David Burke have combined well in midfield, and up front players such as Conor Whelan, Joe Canning, Conor Conney and Jason Flynn have impressed. However, with Wexford playing a sweeper in front of their full-back line all season, Sunday will represent a different challenge for the Galway attackers. Fitzgerald has his charges playing with serious physical intensity, and the Galway players will have been warned to be ready for a big step up in that department. In their championship win over Kilkenny in front of almost 19,000 people in Wexford Park, the big hits were going in all the time and Brian Cody’s team were bullied out of the game in many instances. Any time a ruck developed, it was almost always a Wexford player who emerged with the ball, and Kilkenny had no answer to the intensity and physicality the home side produced on the night. Wexford’s defenders, such as Shaun Murphy, Liam Ryan, James Breen, Matthew Hanlon and Harry Kehoe, really got stuck into the Kilkenny forwards, and only Colin Fennelly, on the edge of the square, make any real impact for Kilkenny. If one player typified the Wexford will to win that night it was Lee Chin. He had an enormous game and his possessions were up around the 20-mark with some spectacular catching that really lifted the team and supporters. Whoever the Galway management team assign to mark Chin, his influence needs to be nullified as he can be a real rallying force for his side. Wexford have improved this year – evident in their two wins over Kilkenny, having beaten them in the league too – and promotion from division 1B, and they are playing with conviction, belief and confidence. As such they represent a big challenge for Galway. However, if Galway match Wexford’s physicality and get enough ball into their attack, they have the forwards to win the game. Conor Whelan, Joe Canning and Conor Cooney will need to be efficient with scoring opportunities, and continue their impressive form. For the last few months advancing to the Leinster final was Galway's target; now they need to go out and win it.